The great British Bake Off week 5 was all about Pastry. 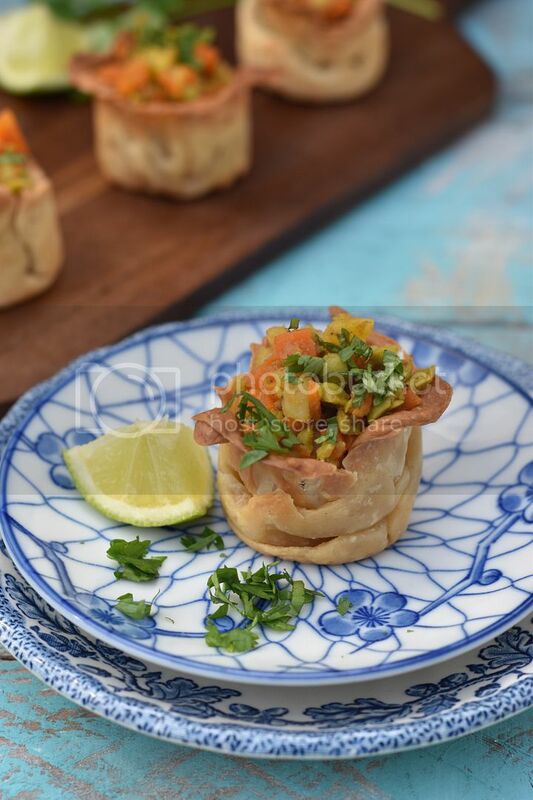 The signature challenge was to create breakfast pastries, the technical challenge was to create a bakewell tart and the show stopper was to create Phyllo Pastry appetisers. I think this was by far the most difficult week especially as pastry is very hard to make right. For this week I have totally gone out of my comfort zone and decided to create Veggie Phyllo baskets. This is the first time I have attempted home made phyllo pastry and it was the most difficult thing I have ever tried. I can't say that my phyllo pastry was 100 percent successful but it did have a few layers and did not have a soggy bottom.The most difficult part was to stop it tearing when trying to stretch it thin and then cutting it to line the muffin cases was a nightmare. It just kept sticking together. Below I am sharing my creation. 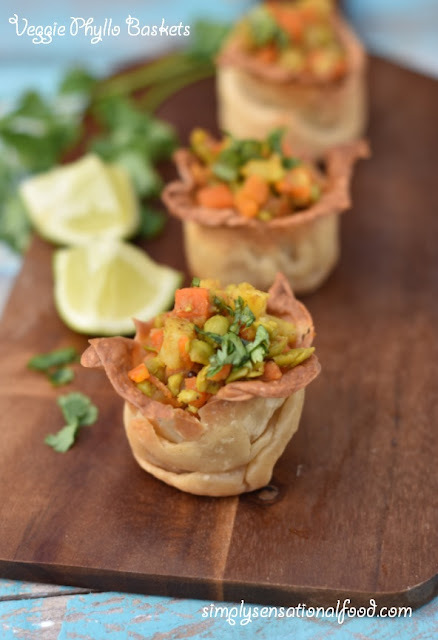 Crispy phyllo baskets filled with a spicy veggie filling. 1. Add the flour, salt and one tablespoonsof olive oil to a large bowl.2. Gradually add the water a little at a time to make a soft dough.Knead the dough for 5 minutes after which cover and rest it for 1 hour.3. In a frying pan add 1 tablespoon olive oil when it is hot add the diced potatoes, diced carrots and the coarsely ground peas.4. Add the salt, turmeric, chilli powder,sugar, lemon juice, ground cinnamon and clove powder and mix it all together. Cook the vegetable mixture on a low heat for 7-8 minutes until all the vegetables are cooked. Remove the filling from the heat and leave aside to cool. 4. Knead the phyllo dough for a good 10 minutes. Divide the phyllo dough into two as its easier to work with and roll it out on a floured surface as thin as you can. 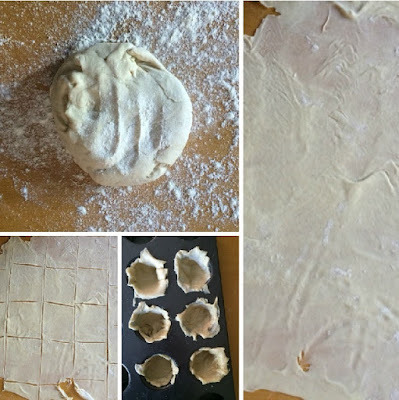 Once you have rolled it out, using your hands stretch the dough further until its like tracing paper.6. Oil a muffin pan with the oil and then cut squares from the rolled out phyllo pastry and line the muffin pan with them. brush each square with oil before layering on the next sheet. Layer 4 sheets in each muffin hole. Line all 24 muffin case hole in tray with the layers of phyllo pastry, gently pushing the sheets in so that there is a cavity for the filling to be filled in later.7. 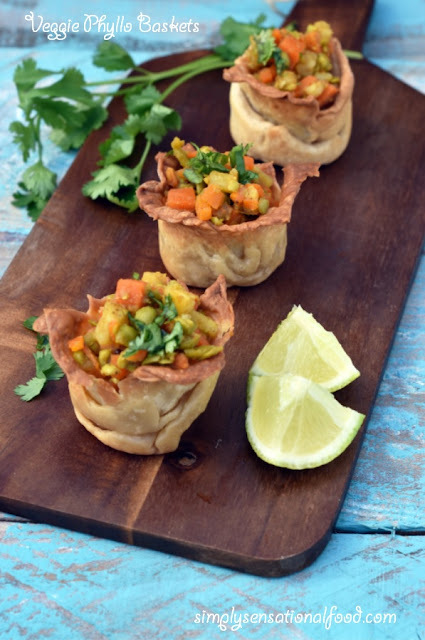 Preheat the oven to 180 degrees C / 35O degrees F. Bake the filo baskets in the oven until golden brown (approx 10-12 minutes)Remove the baskets from the oven and wait for them to cool.Fill each basket with the veggie filling.Garnish with chopped coriander and serve with lime wedges.